1. Preheat oven to 400°F. Lightly grease baking sheet and set aside. 2. In large bowl, combine apples, cranberry sauce, almonds or filberts, sugar, cinnamon and lemon zest; set aside. 3. In medium skillet over medium heat, combine 1/4 cup of melted margarine and breadcrumbs; cook, stirring, until breadcrumbs are lightly browned; transfer to plate to cool. 4. To make first strudel, place sheet of fillo on kitchen towel and brush with some of remaining melted margarine. Top with 4 more sheets of fillo, brushing each with more margarine. 5. Sprinkle 6 tablespoons of breadcrumbs evenly over layered fillo. Top with one-fourth of cheese slices. 6. Top cheese with 5 more layers of margarine-brushed fillo. 7. Two inches in from short edge of fillo, spoon half of apple mixture in 3-inch-wide strip. Top with another one-fourth of cheese slices. 8. Using towel to help, roll fillo tightly up around filling (jelly-roll style), brushing exposed bare surface of dough with additional margarine as you roll. 9. Use towel again to transfer strudel to prepared baking sheet. 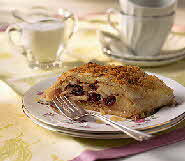 Brush top of strudel with more margarine and sprinkle with 2 more tablespoons breadcrumbs. 10. Repeat entire procedure to make second strudel. Transfer seam-side-down to prepared baking sheet and bake for 20 to 25 minutes, or until nicely browned. Serve warm.